Below is a sample of some of the items in the Foundation's collection. To view a complete list, click here. 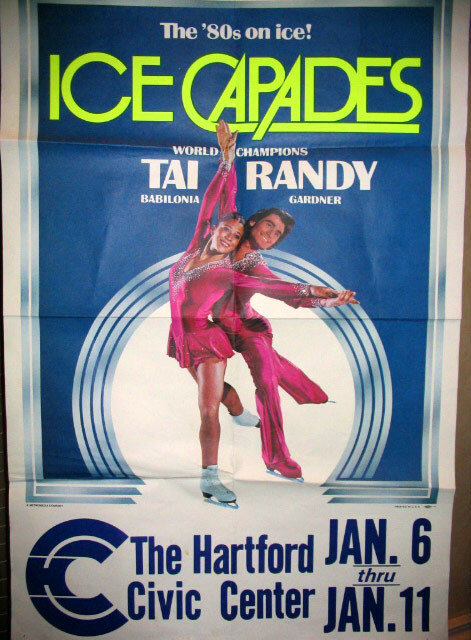 1980 Ice Capades poster with Tai Babilonia and Randy Gardner. "Moiseyev on Ice", (circa 1960's) 5 X 16 Skaters: Jimmy Grogan, Bobby Specht, Helga Tuchniski, Robbie Robertson, Cathy Machado, Phil Romayne, Cathy Steel. "Music From the Ice Capades" featuring Bob Hamilton on the electronic organ. 1952: Feb., April, May, Dec.
1951: Feb., March, May, Nov., Dec.
1950: Jan., May, June, Nov., Dec.
1949: Jan., Feb., May, Nov.
1948: Mar., April, May, June, Nov., Dec.
1946: April, May (2), Oct.
1945: Jan., May, Oct. (3), Dec.
"Skating Through the Years" Published December 1942 (missing cover) Great collection of photos. "The First Twenty-Five Years of the USFSA" 1921-1946. Holiday On Ice - (Unknown date) President, F.A. Goodhart & Produced by Ted Shuffle. "Bolero", "Shangri-La", "Salute to New York". Holiday On Ice - (Unknown date) President, F.A. Goodhart & Produced by Ted Shuffle. "Smurfs", "Gaucho", "Sleeping Beauty". Holiday On Ice - (Unknown date) President, F.A. Goodhart & Produced by Stephanie Andros. "Alice in Wonderland", "Dancesof Die Fledeermaus"
Ice Follies International - 1969?